Now a retired University of Illinois professor, Peters, 73, was among the first 500 Peace Corps volunteers commissioned back in 1961 and part of the inaugural group sent to the Philippines. Since then, more than 200,000 people have served in 139 countries. That first year, Peters remembers, most volunteers were college graduates like him, eager for a "dramatic change in their lives." 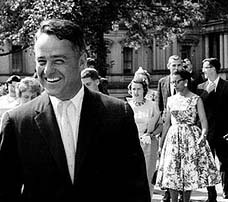 Peters left for the Philippines on Oct. 11, 1961, shortly after Congress authorized funds for the program. One of his first stops was the grave of his Uncle Charlie, who had died in a Japanese POW camp there during World War II. Peters sent several photos to his grandmother; he was the only one of her children or grandchildren ever to visit the grave. After a training period, he was sent to Casiguran, Sorsogon, a small Filipino fishing community. He lived in a second-floor apartment with three other volunteers from Kentucky, Rhode Island and New Hampshire. They had electricity from 6 to 10 p.m. daily. The first few months on the job were a bit ad hoc, Peters remembered in an interview. "There wasn't a clear role for us," he said. Manila and other cities had unemployed teachers, so volunteers had to be given "consultant" roles that Filipinos couldn't fill, he said. An electrical engineer was assigned to teach physics, and Peters and the other two volunteers were asked to introduce a new curriculum to elementary teachers that included English as a second language and science. When they arrived, there were no materials or even course outlines, only "sketchy handouts." His American accent was problematic, and he talked too fast. But they were warmly received by the teachers and the townspeople. "They had no idea why we were there, only that we had been sent by President Kennedy," he wrote in his book. Caption: Ron Peters in 1963 during his Peace Corps service. Fifty years ago, the Berlin Wall was not yet built, the term "Peace Corps" had just been invented and John F. Kennedy's idealism took hold in a young Army Reservist named Ron Peters. Inspired by Kennedy, and his uncles' tales of overseas duty in World War II, Peters decided to see the world and use his teaching experience in a developing country. After his six-month Reserve training, the Buffalo native applied for every overseas teaching job he could find, including Kennedy's new Peace Corps, hoping for an assignment in Africa. He got a telegram in July 1961 from Sargent Shriver - Kennedy's brother-in-law and head of the fledgling Peace Corps - telling him he had been assigned to the Philippines. Disappointed, Peters debated whether to go. His uncle, a World War II vet, advised him not to miss the chance of a lifetime. "Give me that damn telegram; I'll go in your place," Peters quoted his uncle saying in a new book, "Answering Kennedy's Call: Pioneering the Peace Corps in the Philippines." 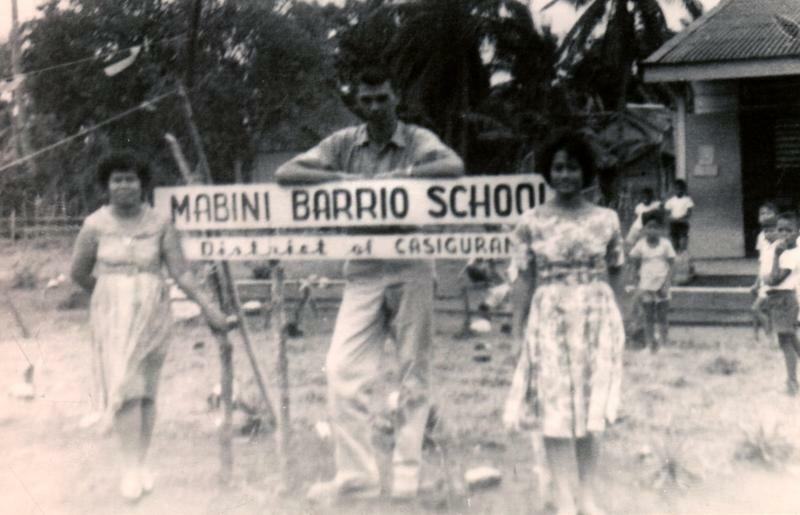 The Peace Corps celebrated its 50th anniversary recently in Washington, D.C. Peters and his wife, Lilia, whom he met in the Philippines, were there. 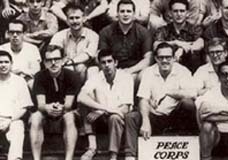 Now a retired University of Illinois professor, Peters, 73, was among the first 500 Peace Corps volunteers commissioned back in 1961 and part of the inaugural group sent to the Philippines. Since then, more than 200,000 people have served in 139 countries. That first year, Peters remembers, most volunteers were college graduates like him, eager for a "dramatic change in their lives." Peters left for the Philippines on Oct. 11, 1961, shortly after Congress authorized funds for the program. One of his first stops was the grave of his Uncle Charlie, who had died in a Japanese POW camp there during World War II. Peters sent several photos to his grandmother; he was the only one of her children or grandchildren ever to visit the grave. After a training period, he was sent to Casiguran, Sorsogon, a small Filipino fishing community. He lived in a second-floor apartment with three other volunteers from Kentucky, Rhode Island and New Hampshire. They had electricity from 6 to 10 p.m. daily. The first few months on the job were a bit ad hoc, Peters remembered in an interview. "There wasn't a clear role for us," he said. Manila and other cities had unemployed teachers, so volunteers had to be given "consultant" roles that Filipinos couldn't fill, he said. An electrical engineer was assigned to teach physics, and Peters and the other two volunteers were asked to introduce a new curriculum to elementary teachers that included English as a second language and science. When they arrived, there were no materials or even course outlines, only "sketchy handouts." His American accent was problematic, and he talked too fast. But they were warmly received by the teachers and the townspeople. "They had no idea why we were there, only that we had been sent by President Kennedy," he wrote in his book. Overall, he said, the teachers seemed to view the volunteers as "personable oddities." The Americans were invited to speak at graduation ceremonies, serve on committees or judge contests at the town fiesta. "Everybody was just working from scratch. Nobody quite knew how to deal with this animal," he said. By the time Peters left in 1963, there were more than 800 volunteers in the country. He met Lilia, a nurse and daughter of a vice mayor there, but they didn't become a couple until two years later in the United States. Lilia was working on an expired visa at Cook County Hospital, and he had a job at Roosevelt University in Chicago, after completing his master's degree at Syracuse University. He ran into a mutual acquaintance and then stopped by Lilia's apartment. Her roommate thought at first he was an immigration officer and told Lilia, "There's some big white guy with a necktie asking for you." She didn't remember him at first, but then invited him to a party with her friends. They married in 1966 and had two children. Peters said it's hard to measure whether the other volunteers had a lasting impact on the village. When he returned for his first visit in 1978, the town had noticeably improved, with constant electricity, paved roads and television service. But they were still using some of the same educational materials from 1963. Peters, a labor expert, has since visited Casiguran every few years to see his wife's family or give professional talks. It has a new marketplace, better housing, cable television and a cell phone tower. But most families have a relative working abroad to support them. He feels he has had a greater impact through his work at the UI's Institute of Labor and Industrial Relations, where he was head of the labor education program from 1976 until his retirement in 2002. In the mid-1980s, he arranged for two young faculty members from the University of the Philippines to do graduate work at the UI. They later became deans of the School of Labor and Industrial Relations there, and ties with the UI remained strong. Ron and Lilia Peters have also helped scores of Filipino students find jobs and acclimate to the United States, both at the UI and at Michigan State University, where he earned his doctorate. Their house is a gathering center, their back yard a venue for one wedding and four receptions, their refrigerator covered with photos of Filipinos. Ron Peters also remained close with his Peace Corps roommates, though two have died in recent years. It's hard for Peters to imagine his life without the Peace Corps. 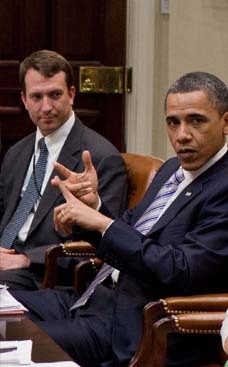 A former social studies teacher, he said he likely would have found another teaching job. He also would have been called up to active Reserve duty with his unit when the Soviets put up the Berlin Wall in 1961, two weeks after he started Peace Corps training. Peters said the Peace Corps broadened his world view. "Certainly your perspective on your own country changes, first of all how much we have here," and secondly how others view the United States, he said. He was in the Philippines when Eugene "Bull" Connor ordered police to use firehoses against civil rights demonstrators in Birmingham, Ala.
"That was on all the front pages of all the newspapers in Asia. When you're the only white person for miles around, and somebody shows you the picture and says, 'Is that the way white people treat dark-skinned people in the United States?' what do you say to that?" said Peters, who returned home a strong civil rights advocate. "Those experiences change your world view on things."